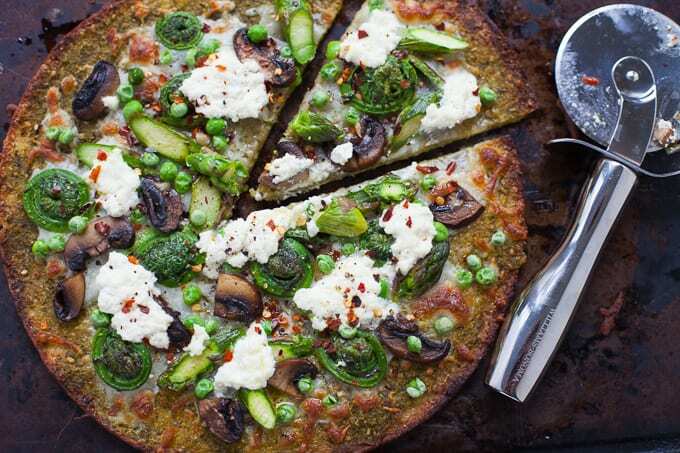 A delicious seasonal veggie-packed pizza, this Farmer’s Market Spring Vegetable Pizza made with Trader Joe’s Cauliflower Pizza Crust is one you’ll want to add to your Friday night pizza party rotation. Sometimes when I start writing a blog post about a recipe, a song pops in my head. For today’s recipe, I started singing Pitbull’s I know you want me. Because I think if this pizza could sing, that’s what it would say, I know you want me. I don’t think this pizza is arrogant. I just think it’s confident and comfortable in its own crust. It knows it looks good. It knows it tastes damn good. It knows it was just featured on Well + Good. And so it sings Pitbull on occasion. 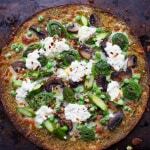 A couple weeks ago, Well + Good reached out to me about the Trader Joe’s Cauliflower Pizza Crust craze, asking me if I would be interested in creating a recipe using it to be featured on their website. I love Well + Good but I love pizza even more so I said yes. 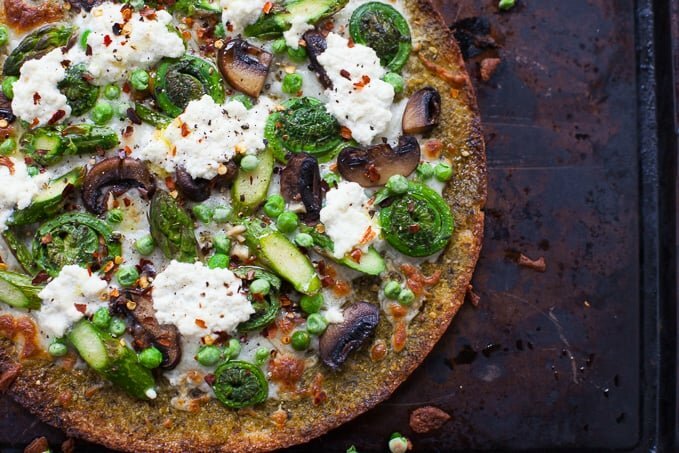 Plus, I was curious about this cauliflower pizza crust trend. I mean I’ve tried every other cauliflower adaptation – cauliflower rice, cauliflower tostadas, cauliflower mashed potatoes, cauliflower dip, cauliflower wings, cauliflower hummus, even cauliflower colcannon. Aaaaand you can mark this as the moment Kara realized she has a cauliflower problem ;). Wow, I had no idea how many cauliflower swap recipes I had on my blog until just now. It makes sense though – it’s so versatile and such an easy way to get more veggies on your plate. So why not add one more cauliflower recipe to the mix? 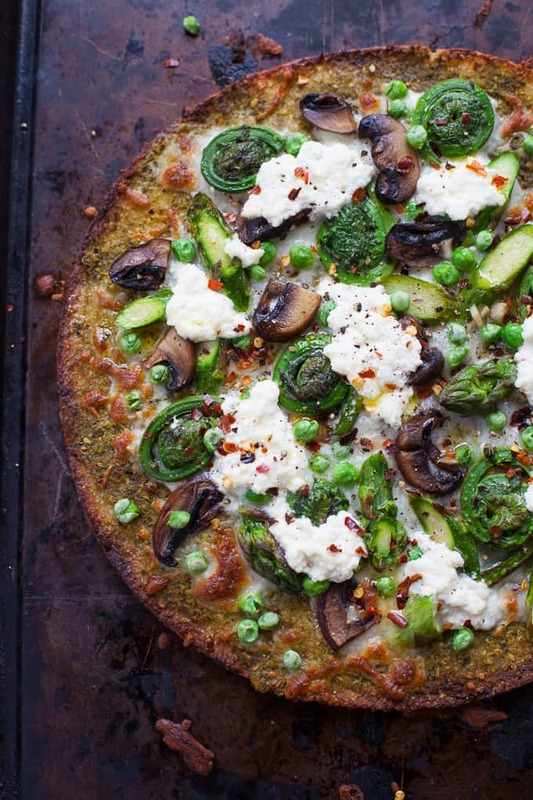 Tracking down this Trader Joe’s Cauliflower Pizza Crust was no easy feat. It’s like the celebrity of groceries right now and everyone wants their hands on it. I went to not one, not two, but three different TJ’s to find it! Now, that’s dedication for pizza right there. It was pretty funny though because I posted some Instagram stories the day I finally found the crust and I got so many direct messages from people saying how they’ve been dying to try it or they’ve been searching all over for it. And I’m like whaaaaat? Do I live under a rock? I hadn’t even heard of it before Well + Good reached out. Worst trend spotter blogger over here. I did a quick Google search and found that oh yes, several national online publications were talking about this crust. I guess we’ve moved on from Unicorn toast and frappes. I decided to make a pizza recipe inspired by the season since seasonality and what’s local and fresh is my go-to for recipe inspiration. Even though summer is around the corner, spring vegetables are still in full force so I used asparagus, peas, fiddlehead ferns and mushrooms (morels are in season right now but I couldn’t find them). Also, this was my first time successfully using fiddlehead ferns! I tried them once a few years back and didn’t care for them (but I don’t think I prepared them right). But these green curly Qs are DELICIOUS on pizza. Fiddleheads, abundant in spring, are the curled fronds of a young fern plant. They have a grassy, nutty flavor, sort of a cross between asparagus and spinach, and pack in vitamins A and C, niacin and potassium. Be sure to wash them thoroughly and don’t eat them raw as they’ve been known to cause food-borne illness. 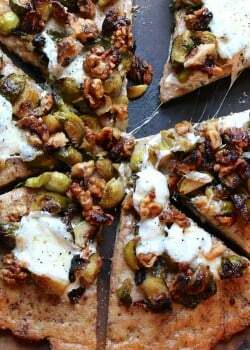 I also love a little ricotta cheese on pizza – it adds a deliciously creamy element to a crispy pizza. So I did about half and half – used a little mozz and a little ricotta. It’s funny the other two pizzas that Well + Good featured were dairy-free and so in the caption of mine they were like “She also doesn’t shy away from cheese, using both mozzarella and ricotta.” I’m like heck YEAH I’m not shying away from cheese. There’s nothing wrong with cheese on your pizza! Unless of course you’re following a vegan lifestyle in which case you’ve made the decision to avoid it. So what’s my verdict on TJ’s cauliflower pizza crust? It ain’t your average pizza crust that’s for sure. If you’re really craving pizza, this might not do the trick – go for the real deal. But if you need a gluten-free alternative or you’re just looking to get more veggies into your day, this crust is a good substitute. With all these delicious toppings on top, I was pretty satisfied. The edges got pretty crispy but not so much the middle. In fact, both times I made this, the crust broke on the first flip. But it easily came back together. Definitely use the broiler – this will help to crisp the crust even more. 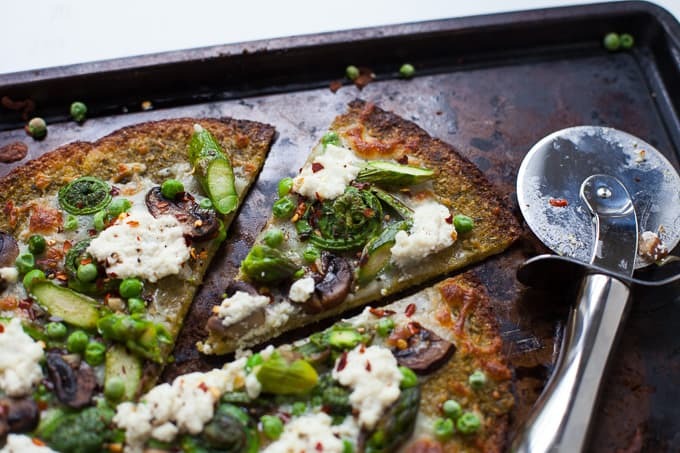 Enjoy this pie while asparagus and fiddlehead ferns are still in-season! Prepare Trader Joes’ Cauliflower Pizza Crust according to package directions. Bring a pot of salted water to boil. Add fiddlehead ferns and boil for 8 minutes. Drain water and set fiddlehead ferns aside. In a medium non-stick pan, heat ½ tablespoon olive oil over medium heat. Add garlic, asparagus, mushrooms and peas and sauté for 3-4 minutes. 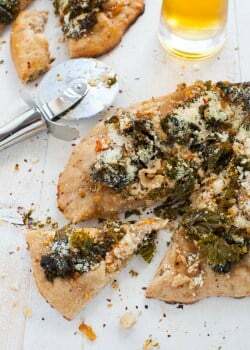 Once crust is prepared, spread pesto evenly over crust. 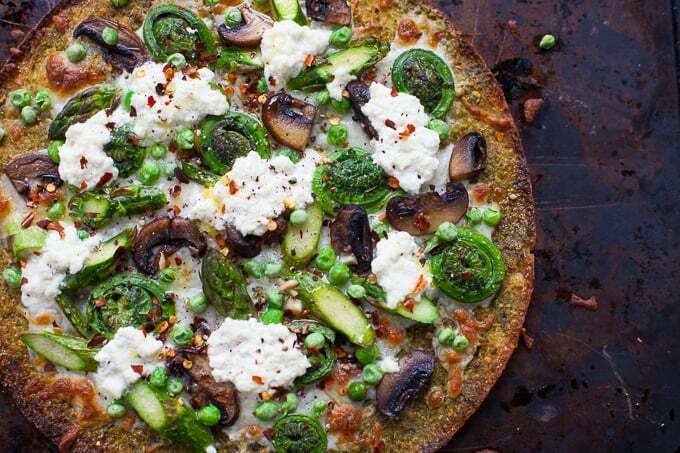 Sprinkle mozzarella cheese over top and add fiddlehead ferns, asparagus, mushrooms and peas. Dollop small spoonfuls of ricotta cheese evenly over crust. 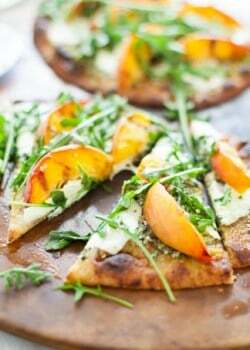 Place pizza under broiler and checking frequently, bake until cheese is browned and bubbly, about 4-5 minutes. Remove from oven and drizzle with remaining ½ tablespoon olive oil. Salt and pepper to taste and sprinkle with red pepper flakes, as desired. 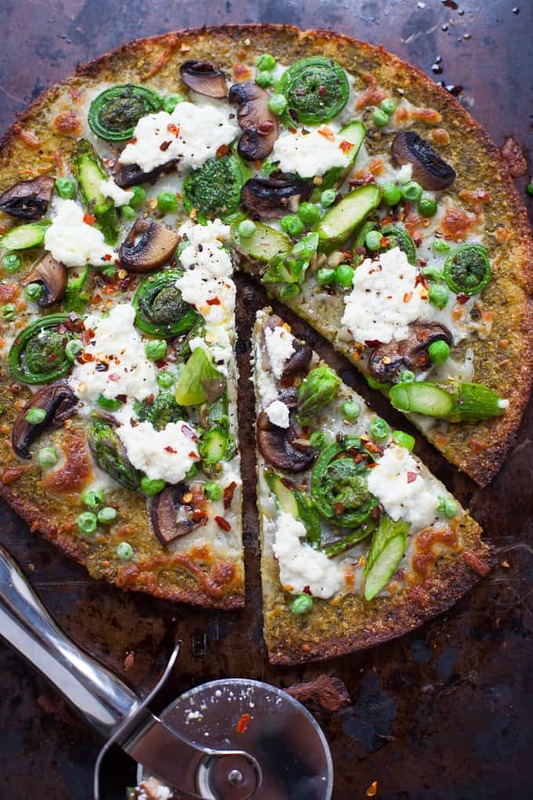 Tell me, have you tried Trader Joe’s Cauliflower Pizza Crust? What about fiddlehead ferns – what’s your favorite way to prepare them? Hungry for more? Check out my other pizza recipes below! Hi Christina, it is so fabulous! I hope you enjoy it as much as I do!